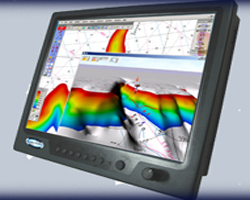 Fredrik Marine carries Marine PC’s professional grade waterproof LED computer monitor, the ML2 series. The ML2DVR has been upgraded from its predecessor with better specifications, while keeping the features that has made it popular among boaters. The ML2DVR series is the combination of the 3 separate input channels. The ML series has been designed to meet applicable military standards MIL-STD-810G, MIL-STD-461E and others, yet is cost effective enough for commercial use. For military operations, the ML2DVR can be used in tandem with night vision goggles, thereby providing real time record playback controls. Up to 4 separate camera inputs are supported via standard BNC connectors mounted on the rear of the unit.The DVR records at 30fps at 24bit resolution for over 32 hours. User customization is also possible with intelligent camera systems via standard ES-232 serial connections. For a better user experience, you can opt to have a touch screen that can operate under wet conditions without fogging, a definite good-to-have for boaters. Common usage include boarding/event video capture, underwater and surface inspection/investigation. The RAM mount is easily and quickly removable from the vessel.